The next DVD from Warner Home Video will be titled Happiness is... Peanuts: Go Snoopy Go. Due out October 9, 2012, the DVD will (like its predecessors) feature two half-hour shows: the 1992 show It's Spring Training, Charlie Brown and "It's that Team Spirit, Charlie Brown," episode #12 of The Charlie Brown and Snoopy Show from 1983. It's Spring Training, Charlie Brown has a story similar to the classic 1966 special Charlie Brown's All-Stars: a local business will sponsor Charlie Brown's team and give them uniforms if the team can win the first game of the season. But will an early round of spring training in the snow and new team member, the tiny Leland, be enough help for them to get the win? It's Spring Training was previously released on DVD by Paramount, but that DVD has been out of print for years. There are no special features on the DVD. Happiness is... 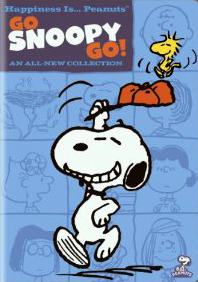 Peanuts: Go Snoopy Go will have a suggested retail price of $14.97.